Thinking of taking up the wonderful hobby of RC helicopters, or just want to learn more about them? If so, you've come to the right place. A site dedicated to helping people new to the hobby in a friendly, inviting, and informative manner. 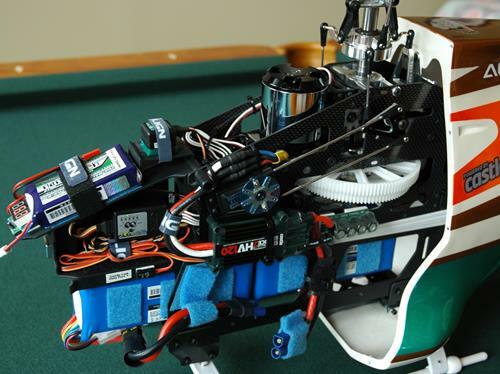 So sit back, grab a beverage, and let's start having a little "RC Helicopter Fun!" I've been flying and introducing newcomers to RC (radio controlled) helicopters for almost 30 years. In those three decades, I've seen so many advances in this fun hobby. The single biggest one is this hobby is no longer a super expensive, difficult, and almost elitist form of RC flight like it once was. There are RC helicopters now for every budget and ability, in a vast array of types and sizes. RC equipment has also improved immensely and has never cost so little. In short, there has never been a better time to get into the hobby! 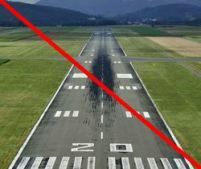 You Won't Need A Runway! Unlike most RC airplanes, radio controlled helicopters don't need a large mowed or paved runway. They take-off & land vertically, so any open area will do. This freedom of taking off & landing anywhere is what first sparked my interest in radio controlled helicopters. "Convenience" sums it up best. It's still the number one benefit for so many of us in the hobby. Whenever you have a desire to go flying, it can be as simple as walking out into your yard with heli in hand, to get some time on the sticks. This is a HUGE time saver over having to cart a bunch of RC gear out to a crowded flying field when you don't have the time. What about flying during rotten weather? It's no problem when you have a small micro electric indoor RC helicopter to fly in your own home or at the office. Radio controlled helicopters are such a fun hobby and enjoyable past time. They also teach you a great deal about rotary flight in its many forms, which for many of us, are the most fascinating aspects of radio controlled helicopters. Flying a Multi-Rotor RC Heli By FPV (first person view). 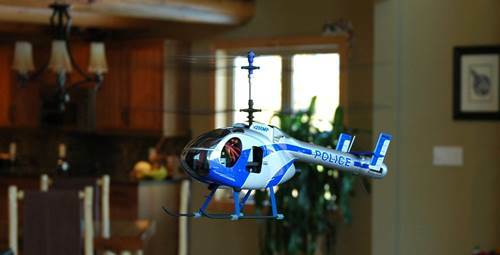 The number and specific types of radio controlled helicopters available these days is quite overwhelming. All have pros and cons, and all offer their own unique levels of fun, challenges, and rewards. The cost of RC helis and equipment has gone down over the past couple decades, while the technology keeps improving as does the usability. 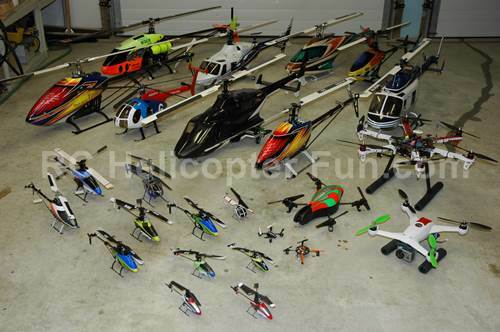 There is one down side to this huge selection of radio controlled helicopters. Information overload! Unless you have some basic facts and understanding, you likely won't choose the best RC helicopter for you. This usually leads to frustration, crashing, and discouragement. 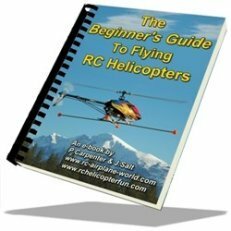 I know many folks who gave up with RC helis before ever getting to experience the thrill and pure joy of piloting one, because they simply got in over their head too soon, without understanding the basics first. Unfortunately, there is also a good deal of junk out there that will add to these frustrations. In fact, RC aviation as a true and lasting hobby is in distress right now because of this "low quality saturation". No longer are folks taking up RC helicopters and planes by investing the time and effort into what for many, then becomes an immensely rewarding lifelong hobby and pastime. Now, more times than not, it's all about the lowest cost, easiest out of the box, instant gratification fix possible. No skill required, no knowledge needed, and no fun & rewarding lifelong learning curve involved. Boredom is inevitable in short order and they simply move onto the next fad; they are not into it for the love of helicopters like us certifiable rotor heads are. Much of my website on the other hand, is geared 100% toward true RC helicopter enthusiasts that can't wait to start learning about these fascinating machines and take up the hobby in one, or many of its forms. The Radio Is What We Use To Control Our Radio Controlled Helicopters. Click Image To Learn About Them. Saving you time, money, and frustration. Above all, I want you to have brilliant fun in your RC helicopter journey so you will passionately want to stick with the hobby for years to come. Large Collective Pitch Turbine Powered RC Heli - The Sound & Smell of a Jet Engine Is Hard To Beat! 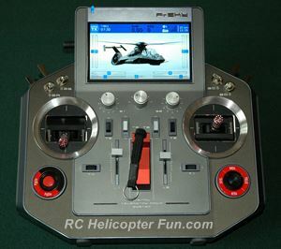 Large turbine powered collective pitch RC helicopters such as shown above are mechanically and electronically complex. You have to enjoy "wrenching" and learning with these types of radio controlled helicopters. It can take years to become proficient, and that's all part of the fun. This is not true of RC toy helis, and various micro size hobby grade RC helicopters which can offer up "out of the box fun." Quad Rotors (also called Multi-Rotor and incorrectly Drones) are likewise easy to own & fly. These fun RC aircraft, have sophisticated electronic stabilization systems and very few moving mechanical parts for those of you who are not much into "wrenching". All these micro and smaller radio controlled helicopters and quad-rotors, are fun and fairly easy to fly for kids and adults alike. They are all completely different machines. They fly very differently from one another. They require different levels of time & learning/practicing commitments. They require different levels of mechanical & electronic skills. A little homework on your part is thus needed to make an informed decision for you, or someone else if you are thinking of giving one as a gift. Scale Bell 222 Collective Pitch RC Heli - If You Like Real Helicopters, Scale RC Helis Are For You! But they are not for the RC Helicopter Newbie. The Challenges & Rewards In What Is Generally Considered The Ultimate Level Of Fun & Achievement In Our Hobby. 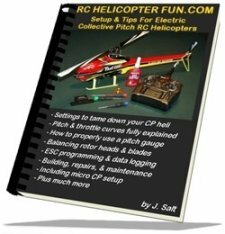 Yes, collective pitch RC helis are both challenging and very rewarding. In my experience with pretty much everything in life, "challenging" and "rewarding" are inseparable. The easier the challenge, the less rewarding it is (and vice versa). This is why collective pitch (CP) remains to be the holy grail of all types of RC rotary flight. So why is CP so challenging? Collective pitch helicopters (model and full size) are not positively stable; meaning they are unstable, especially while hovering. Hovering a collective pitch RC heli is similar to balancing on a big ball. This is why the collective pitch RC chopper is more difficult than other RC vehicles. You are constantly making multiple control corrections simultaneously to keep it somewhat stationary, in a state of hover equilibrium. I call this "active piloting". Joking aside, these constant & multiple control corrections connect you to your helicopter like no other RC vehicle. You're totally focused and "immersed in the moment." I enjoy activities that have me so focused and engaged, I don't have the time or room in my head to worry or stress about all the problems that life throws at us. There haven't been many activities over the years I have participated in that provide that "living in the moment" fun escape route. Flying, building, and working on a collective pitch RC heli is however, one of them! It's such an engaging hobby in that respect and stress reliever. There is no question that is why I (and I hope you as well), love flying collective pitch to this day - it's my/our escape! Please don't dismiss collective pitch because it seems hard or even impossible at first. Think back to when you were first learning to ride a bicycle; one of the most frustrating yet fun things most of us can remember from our youth - same idea here (less the scraped knees and elbows). 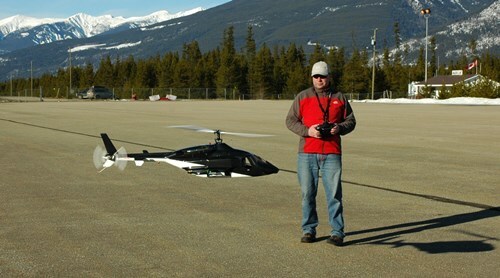 Once you learn how to hover a collective pitch radio controlled helicopter, you'll never forget! I can still remember the day I had my first successful hover many years ago. It was an amazing feeling and experience. The continuous control corrections become second nature, you don’t even realize you're doing them. After trying and trying with short little hops off the ground, which slowly become longer and longer in duration, something clicks! Learning To Fly A Collective Pitch RC Helicopter Is Something You'll Never Forget! Your brain gets it and you are entirely immersed in RC euphoria as you see your helicopter hanging in the air under your full control. You're on cloud 9 for days. You have to keep flying & practicing, getting better and better. Every day you go out flying and come home, you can't wait to get back out flying again. A natural high occurs and yes, you are usually addicted to the hobby at this stage :-) Having more and more fun every time you go out, and perhaps even dreaming of one day (with lots of practice), becoming a pro RC helicopter aerobatic 3D champion. Many who get bit by the RC heli bug in the simpler or easier to fly versions, naturally have an underlying desire to give collective pitch a go. You simply won't experience that feeling of hovering euphoria with those easy to fly helicopters or electronically stabilized quad-copters. 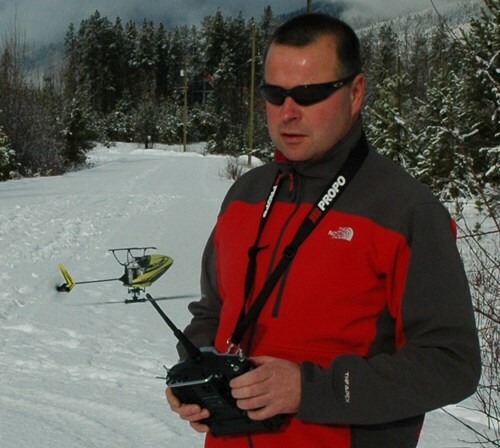 It's hard to resist the challenge, performance potential and overwhelming feeling of accomplishment offered with collective pitch RC helicopter flight; not to mention the awesome sound! It is after all the closest most of us will get to piloting a full size helicopter. We have the same primary flight controls as the big birds do. Micro sized collective pitch radio controlled helicopters have likewise revolutionized the hobby because of their low cost. They are just as challenging to fly (more so actually); but don't think you have to spend a couple thousand dollars like we once had to. Of course hovering is the first step, the fun is only beginning – wait till you do your first loop or roll. Yes, now the adrenaline starts flowing. 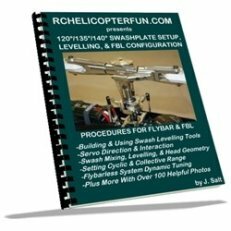 Besides the flying fun, is the technical fun of understanding and maintaining a collective pitch RC helicopter. For many, that is the most rewarding aspect of this hobby; I fall into that category myself. Collective pitch RC helicopters have taught me and many others so much about aerodynamics, physics, mechanics, and electronics (in a very fun way I should add) over the years, and I'm still learning new and fascinating stuff almost daily! That aspect of the hobby alone is somewhat priceless and the older I get, the more I appreciate its value. Learning when it's this much fun, is after all, one of life's great pleasures and joys. Electrical & mechanical components inside a typical collective pitch RC heli. Fun to learn & crazy cool! If so, it's a safe bet to say you likely already have a healthy interest in this hobby. I hope the rest of my site will further help "fuel" your RC heli interest into a full blown passion! The navigation on the top of the pages, has all the main RC heli topics with sub navigation drop-downs. If you find the information useful and helpful, feel free to bookmark this site, Face-it, Tweet-it, link/share the pages, or subscribe to my "Heli Blog". Tell your buddies & get them into the hobby as well. Wishing you good success & happy flights!